Most spotlights force you to choose between power and run time. Now you can have both! With 750 lumens of ultra-bright power, 7 hours of run time on a single charge, and a beam distance of over 275 meters, the 41-1080 has the power and long battery life to satisfy even the most demanding user. The 41-1080 Spotlight features 3 super bright, high flux Cree LEDs which provide 750 lumens of light and a beam distance of over 275 meters. 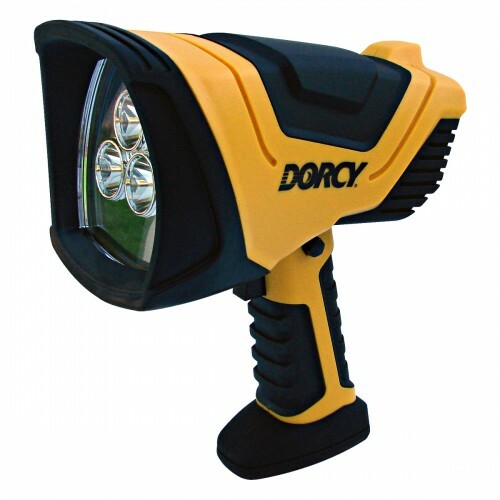 An incredible 7 hours of run time is accomplished using Dorcy's new battery saver technology. Other features include rugged construction, no slip rubber grip, convenient trigger locking switch, and the ability to charge via both AC and DC connections. A perfectly proportioned design allows the light to stand on its own for hands free use. The 41-1080 comes complete with AC and DC adapters for easy recharging, at home or on the go.